I don't know about you, but when it comes to my jewelry I feel as though I am constantly losing items in piles, tangles, or in jewelry storage boxes. About a year ago, I decided to neatly organize my necklaces and hang them up on my wall by my vanity. This was amazing. Not only could I see what necklaces I actually owned, but the display turned out to be a bit of "wall art". Now that the necklaces were organized, I still had rings, bracelets and earrings. My rings, I eventually stored on this cute Eiffel Tower ring stand (similar here) and my bracelets stored on this cute acrylic jewelry stand. The only thing left... earrings. 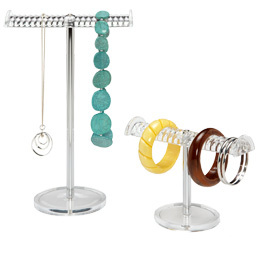 See below my display for how I try to neatly store my jewelry. Major benefit of doing this: you get to see what you actually own. How do you store your jewelry? Let me know in the comment section below! I have something similar for my bracelets but I need another one. I love that necklace idea! Mine are currently getting tangled in a drawer. Great idea! I love anything Lucite. I use it in my clients houses all the time so why not for jewelry storage? Adorable. I have a black, lizard jewelry box for my nice things and then I actually keep my necklaces on this west elm horn lamp I have ... kind of a hot mess, but it works :) Cute blog!